The heaviest snow falls Sunday morning, at an inch or more per hour. It's finally here. I started talking about this a week ago, last Sunday night. With all the talk, this is one of those storms that can be exhausting before the first flake flies. 1) Heavy snow, especially Sunday morning. 2) Ice on top of the snow, from a change to sleet and freezing rain. 3) Brutal cold, especially after the storm. If you're at the coast, you'll also have to contend with tidal flooding Sunday morning, between about 8 a.m. and noon. Combine astronomical high tides with the storm surge, and we have a problem. 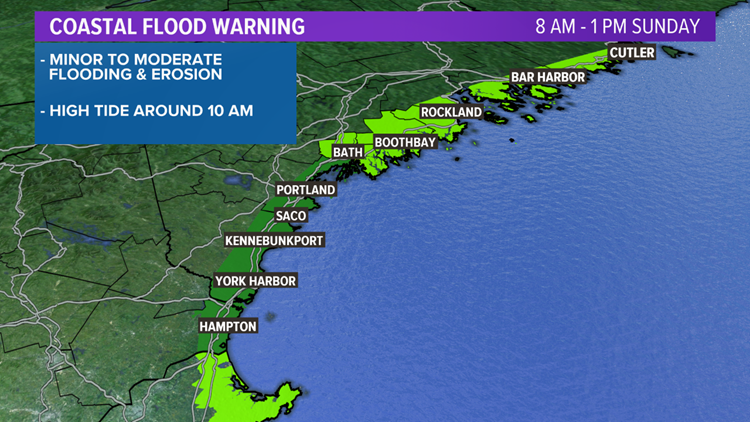 Minor flooding is possible for the Midcoast and Downeast; moderate flooding is possible from Casco Bay south to the seacoast, in the usual spots. If you're there, be safe, but let us know what happens where you are. 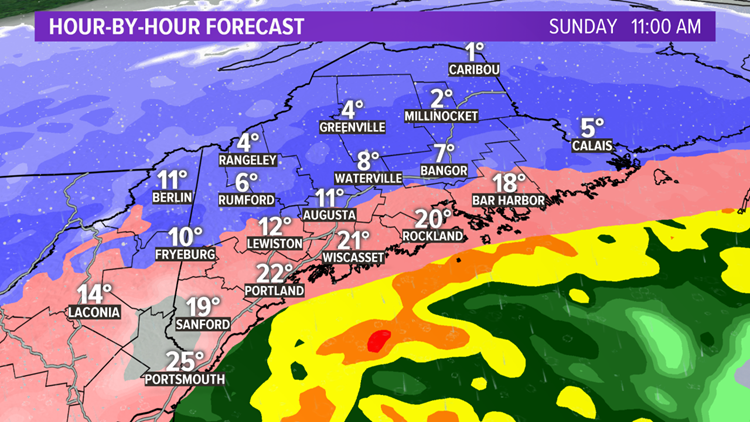 Snow is picking up in intensity and in western Maine, it'll be heaviest from about 3 a.m. on. 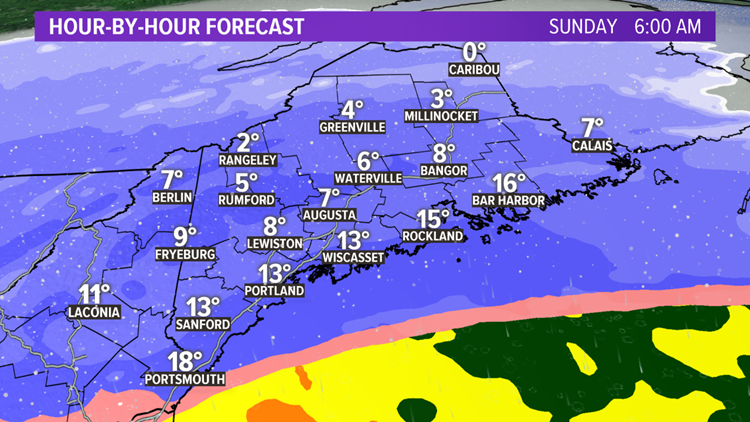 In eastern Maine, it will be from about 6 a.m. into the midday and early afternoon. Warmer air will start to move in aloft, but at the surface, it will remain cold. This will switch the snow to sleet near the coast between 9 a.m. and 11 a.m., maybe a bit earlier in York County. This sleet may progress inland for a while during the middle of the day. Remember, "sleet pings, freezing rain clings". Sleet is annoying, difficult to move around and makes travel a mess. Freezing rain is what can weigh down trees and power lines, causing outages. 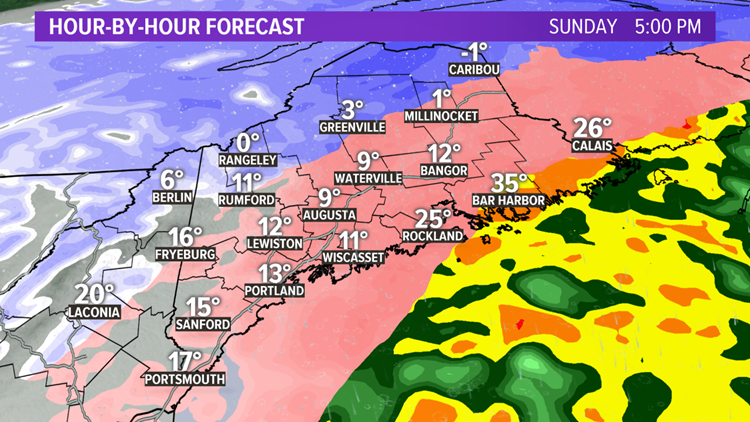 Some freezing rain is possible along the coast, especially from the Midcoast to Downeast. This is where the ice could become significant enough to impact trees and power lines. Power outages are possible. The sleet may flip back to light snow late in the afternoon, with precipitation lightening up late afternoon and evening. 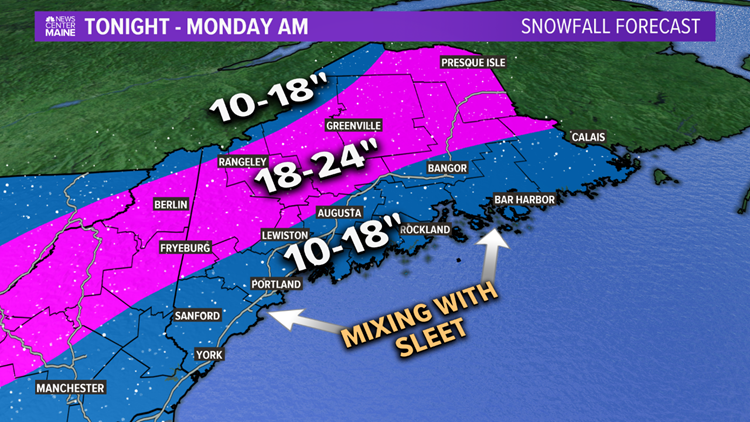 Still expecting 10 to 18 inches of snow for central and southern Maine, mixing with sleet. 18 to 24 inches of snow is possible in the mountains into northern Maine, where they stay all snow. The bitter cold air behind the storm will make it difficult to clean up. Some of the snow may blow and drift back on to the roads, and road treatments could be ineffective with temperatures dipping into the single digits and below zero. Hang in there, it's winter in Maine.